I've been working on the beautiful feathering of the English Setter's coat. 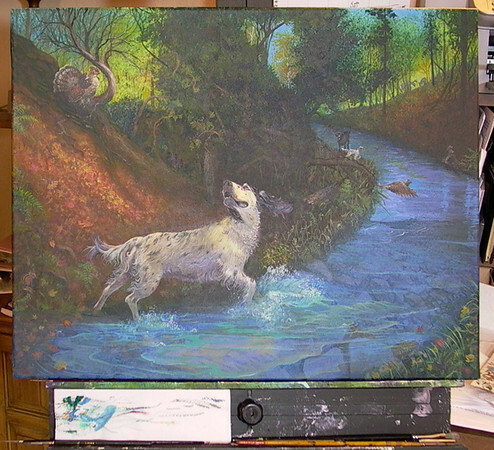 There's definition now to the water and added creatures and leaves scattered about. I've also decided on the name for the painting to be: Pointer's Paradise. In the background a young Llewellin English Setter has been painted in (her name is Shelby) along with our Black Lab (Brandie). Just a day or two more and the painting will be complete. I'll do some test prints on canvas and paper and have some other products made before offering them for sale.